I asked Airwave to tell me if an AP was “over 75% busy for more than 5 minutes”. I started to receive about a dozen alerts a day by e-mail. A few of these I checked out, including one from two APs which were located in close proximity to each other. The alert itself contained links to the Airwave graph showing how busy the AP was at the time. I’ve included the graph in the infographic below (click for full view!) as it shows clearly what was happening. Look at those traces – so very similar that the bulk of the traffic must be coming from a single transmission! 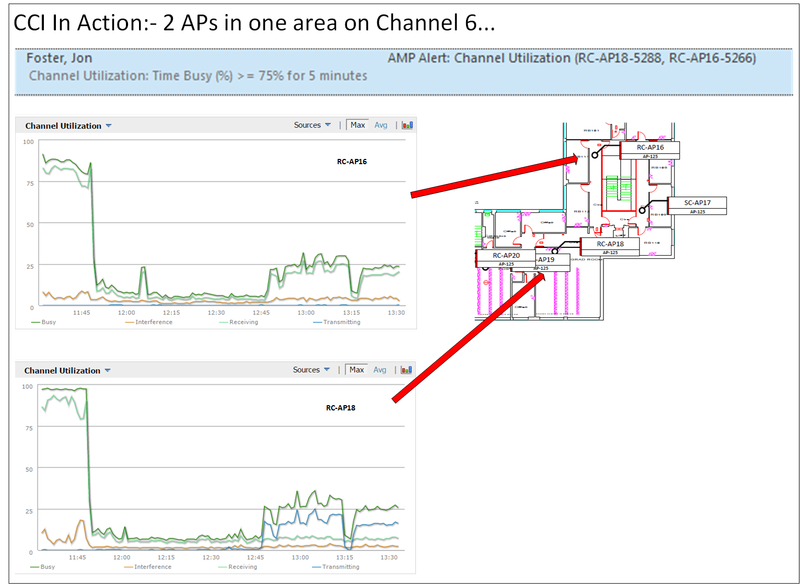 Double checking proved that both APs are indeed on the same 2.4 GHz channel – Channel 6. 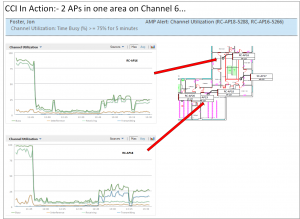 From the graph it looks like AP 18 is transmitting and AP 16 is experiencing this as CCI – it’s ‘Receiving’ line closely matching the ‘Transmitting’ line from AP 16. Note also the ‘Receiving’ line from AP18 – constantly around 7%. This is the bandwidth which is lost from overheads such as beacons, etc.